Time for the relatively new meme hosted by Ms. M. It's the opportunity to share a mystery you're reading or planning to read sometime soon. Since mystery is one of my favorite genres, it's a perfect fit for me. I'm hoping to see many of my blogger friends posting here as well. Today I'm featuring a recent read, Alice and the Assassin, the first book in the Alice Roosevelt Series . . .
My thoughts: A thoroughly entertaining historical mystery featuring the unconventional 17-year-old first daughter Alice Roosevelt, whose father Teddy has just become president after the assassination of William McKinley. 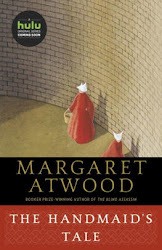 In Koreto's imaginative novel, the highly inquisitive Alice takes it upon herself to investigate the vile act, and in the process finds herself drawn into the company of anarchists and other dangerous characters as she pursues conspiracy theories. The story is told in the voice of Alice's Secret Service bodyguard Joseph St. Clair, himself a colorful character. A former Rough Rider who served with Teddy Roosevelt, the fictional St. Clair favors Stetson hats, cowboy boots and long riding coats, which make him stand out in Alice's social circle. The Wyoming lawman is a perfect match for young Alice, however, and the only one with a chance to keep her rambunctious spirit in check. 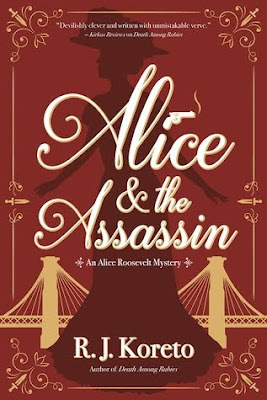 Their adventurous investigation is action-packed, and even though they bring it to a successful conclusion, they must answer to the Roosevelt family for Alice's unorthodox behavior and St. Clair's role in aiding and abetting it. Will this dynamic duo survive the consequences? Book two in the series, The Body in the Ballroom, is sure to provide some answers. This new mystery series delivers a solid whodunit, and a glimpse into the life of a famous historical family, New York society, and national affairs at a very significant time in American history. From Goodreads: In 1902 New York, Alice Roosevelt, the bright, passionate, and wildly unconventional daughter of newly sworn-in President Theodore Roosevelt, is placed under the supervision of Secret Service Agent Joseph St. Clair, ex-cowboy and veteran of the Rough Riders. St. Clair quickly learns that half his job is helping Alice roll cigarettes and escorting her to bookies, but matters grow even more difficult when Alice takes it upon herself to investigate a recent political killing--the assassination of former president William McKinley. This Mmm--Mystery Monday post was originally composed and/or compiled and published by Catherine for the blog, bookclublibrarian.com. It cannot be republished without attribution. Sharing this original post on Twitter, Google+ and/or other blogs with appropriate recognition is appreciated. I haven't heard of this one. It sounds really interesting. Thanks for stopping by my blog and participating in Mystery Monday! I think this book and series sounds great! I love info about Presidential families and as I understand it, Alice Roosevelt was a bit of a handful. Ha! I'll watch for this.